For over forty years, Rob Caughlan has been creating media campaigns focused on saving endangered wildlife, reducing motorcycle fatalities, and championing environmental protections. He has also worked to elect politicians invested in good, productive government and to generate fanfare for the commendable efforts and achievements of recognized corporate leaders. As an activist, Caughlan co-founded Friends of the River. The Surfrider Foundation elected him to be their first president which turned into six terms. During his tenure he acted as their plaintiff and won, in terms of violations, the largest victory for clean water in American history. Originally, his national political activism began alongside the late David Oke with efforts to impeach Richard Nixon. They were having so much fun with the projects that they decided to start the Roanoke Company, an advertising and public relations firm that specialized in “good deeds” media. Caughlan was Senior Vice President of the Roanoke Company for thirty-three years. The company managed a decade-long media campaign for the California Highway Patrol motorcycle safety program. Their ads helped reduce the motorcycle fatality rate in California by 70%. They also won a contract with the California Department of Fish and Game to promote to its Endangered Species Preservation Program. They worked on that account for six years and during those years they raised $7 million for the program. Rob Caughlan has also been involved at varying levels making films that focus on the environment, including: the effects of a growing population (Future in the Cradle), global environmental issues (Voice of the Planet), and the need for solar energy (Solar Energy - The Great Adventure). More recently, he received rave reviews for the documentary Pete McCloskey: Leading from the Front which he both directed and produced; it aired on 180 television stations around the country. Rob Caughlan's devotion to public service has also been recognized with an Outstanding Citizen award given to him by the city of San Mateo, California where he has been a lifelong resident. He started surfing when he was fifteen. 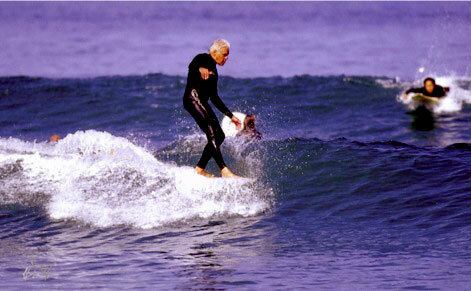 “Riding with the easy grace of a man who has caught thousands of waves, the silver-haired surfer seems at home in the ocean.